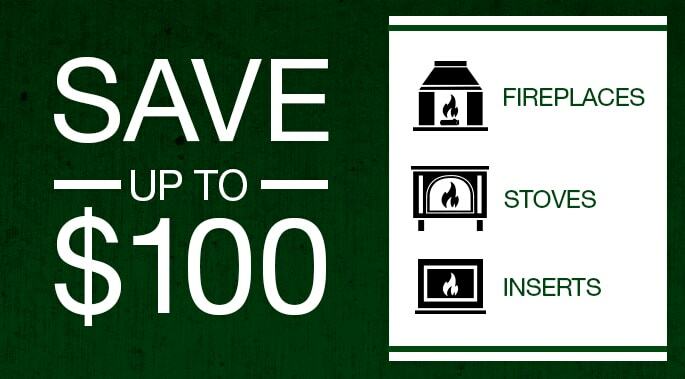 Are you aware that the right fireplace or stove can also help reduce your heating costs? When it comes to creating ambiance and warmth in a home, nothing can beat a fireplace, especially during this time of year. But are you aware that the right fireplace or stove can also help reduce your heating costs? Or that your existing fireplace’s efficiency can be boosted significantly by installing an insert, and for less money than you might think? Here are five facts about fireplaces and stoves that may surprise you. 1. You can conserve energy, live a greener lifestyle and combat volatile heating costs with a high efficiency fireplace or stove. Do you use every room in your house every day? If not, try zone heating the areas where you spend the most time with an efficient fireplace or stove. It will cut down on the amount of fuel consumed by your furnace and can reduce home heating bills by 20-40 percent, according to the Hearth, Patio and Barbecue Association. Simply turn down the central thermostat and let the fireplace heat where you live. This works whether your fireplace is fueled by natural gas, liquid propane, wood, pellets or other materials. Renewable fuels like cord wood, pellets and other plant-derived materials are excellent sources of heat. The key is burning them in a high efficiency fireplace or stove, which makes the process much easier than it was for our grandparents. For example, a load of quality wood in a standard Quadra-Fire. EPA-certified wood stove can produce heat for up to 15 hours, and in pellet stoves a single 40-pound bag of pellets can produce heat for up to 24 hours. In both cases, the amount of emissions and ash generated by these units has been dramatically reduced. There is also a U.S. tax credit in 2010 of up to $1,500 for the purchase of qualifying wood and pellet stoves. 2. A fireplace can be installed in your existing home without the hassles of adding a traditional chimney. Don’t have a fireplace? 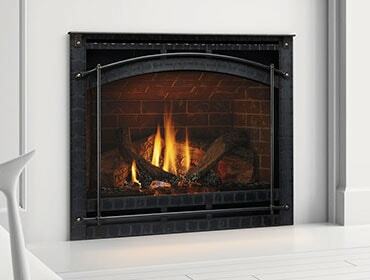 In most homes, a beautiful and efficient gas fireplace can be added for as little as $3,500, including installation. Made possible by direct vent gas technology, the fireplace is vented to the outdoors via a single pipe that runs through the side of the house to the outdoors, drawing air needed for the fire and expelling its byproducts. Direct vent gas technology has brought warmth and ambience to millions of homes. 3. Your inefficient wood burning fireplace can be transformed into a powerful and beautiful heat producer. If you have a masonry-built wood burning fireplace that is drafty and inefficient, consider updating it with an energy efficient fireplace insert. 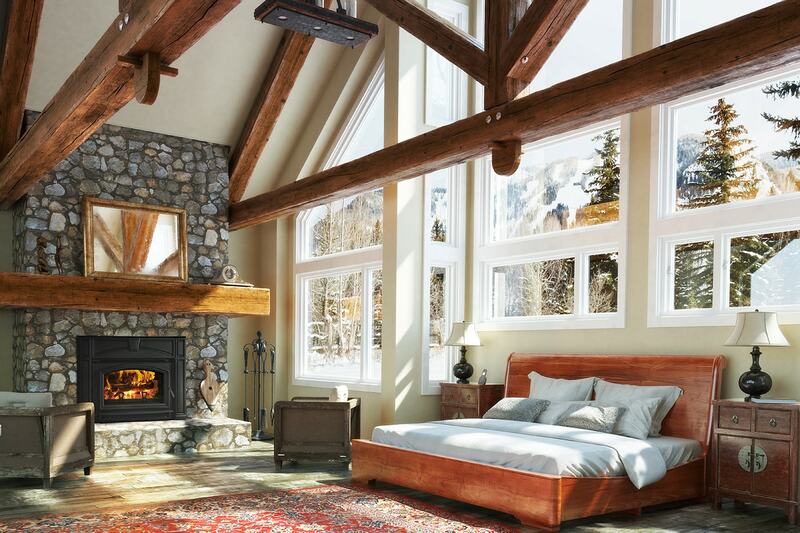 “It is a fairly simple process to transform these fireplaces into energy efficient powerhouses,” says Jeni Forman of Quadra-Fire. “Professional installation can be completed within four to six hours, and it could make your fireplace up to 85 percent more efficient.” The cost of adding an insert, including installation, can be as low as $2,900 for gas and wood-burning units, and $3,200 for pellet-burning inserts. 4. You can control the heat produced by today’s fireplaces. Many fireplaces and stoves can be thermostatically controlled – you decide how much heat you want and change it as desired. Some models also allow you to control the height of the flames and have LED lighting in the embers, which can be turned on or off. Controls are accessed either via remote control, on the unit, or they are wall-mounted. 5. Modern fireplace design is pushing traditional boundaries. If you prefer a traditional fireplace that burns real wood, or simulates it with gas, manufactured logs and burning embers, there are literally hundreds of models from which to choose. However, if your design style leans toward contemporary and you want some new options, today’s modern style fireplaces offer simplistic beauty and elegance. Inspired by European design, many modern style fireplaces are linear in shape, showcasing a panoramic view of the flames that dance in unison with colored glass, shiny metal or other innovative materials like black onyx. Placement is also being redefined, as modern style fireplaces are often positioned at eye level, evoking a living piece of fine art. It’s winter and there’s nothing better than cozying up to a warm fireplace. Investigate the possibilities at fireplaces.com. The site includes an online program that walks you through the process of designing your fireplace, mixing and matching options with rooms, flooring and wall colors.